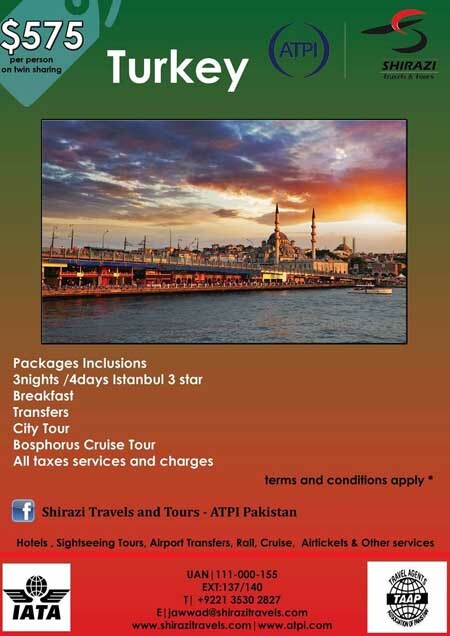 Shirazi Travels is the exclusive partner of ATPI in Pakistan, a global partnership of leading independent travel management companies, and specializes in all types of leisure and corporate travel. Established in 1976, Shirazi Travels has the experience and reliability you need for all of your travel requirements coupled with friendly and personalized customer service for an enjoyable and hassle-free travel planning experience. The team at Shirazi Travels is committed to delivering quality service to its clients with a personal touch. As a leading industry player, Shirazi Travels has a global network of hotels and travel-related service providers which continually offers you the most competitive rates. 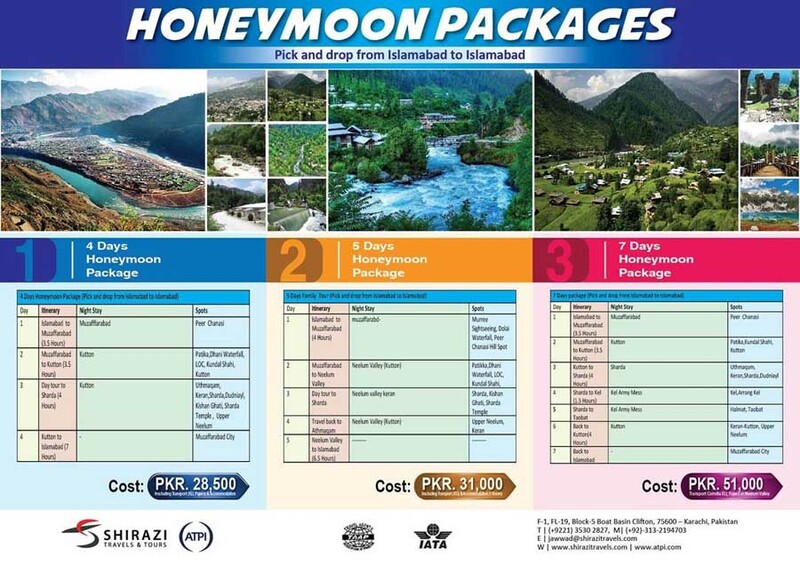 Shirazi Travels offers a range of packages, services and products to make your holiday or business trip a breeze. From regular services like outbound tours, hotel reservations, surface transportation, airport transfers and visa application to niche products such a Corporate Travel and MICE, Shirazi Travels is a one stop solution for all of your personal and company’s travel needs. 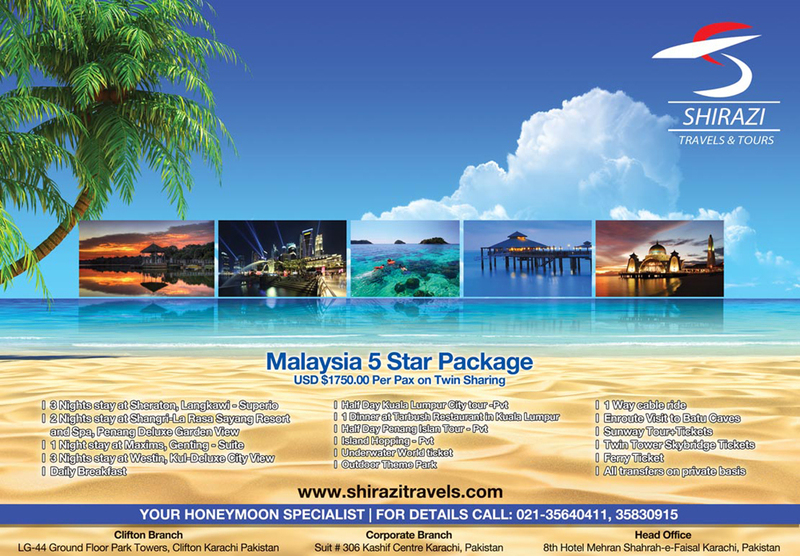 Shirazi Travels is the first BSP and E-ticketing agency in Pakistan. 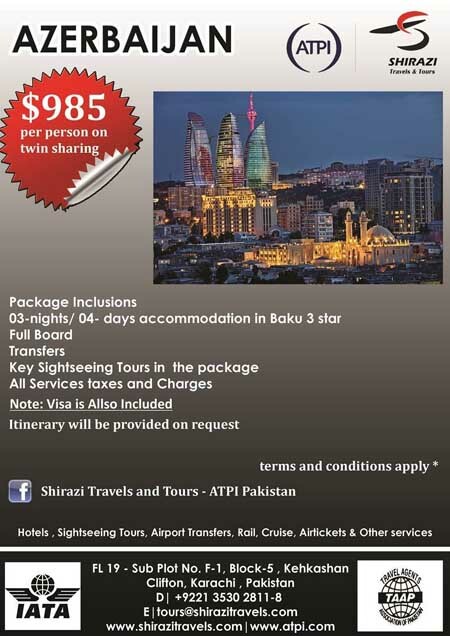 Shirazi Travels Pvt. 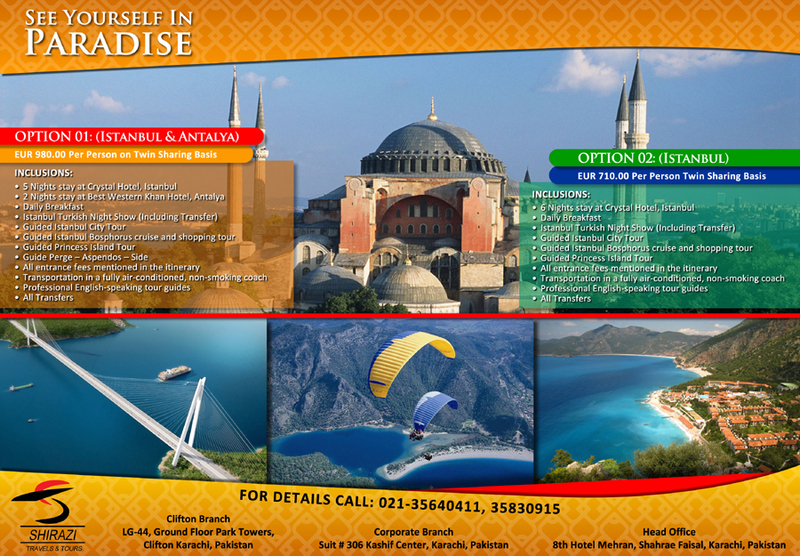 Ltd Pakistan has more than 35 years of experience and a renowned reputation in the travel industry. 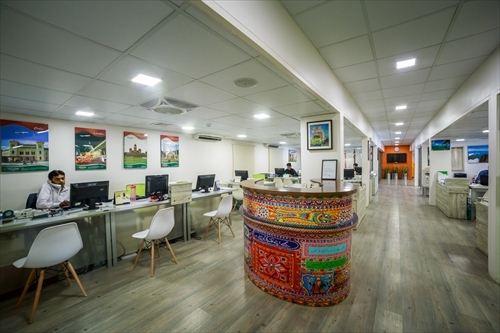 Established in 1976 with just 5 employees, Shirazi has grown to employ 40 employees and establish three locations to serve Karachi residents and visitors. Today, the team continues to deliver quality service to each of its clients. Shirazi Travels strives to be innovative, socially responsible and receptive to change in order to offer high quality travel service to its clients, while maintaining a high degree of professionalism and integrity towards the company’s stakeholders. Shirazi Travels employs a dedicated staff that believes in aligning with the company’s vision, which is to deliver the best travel products and services to its valued clients. Shirazi Travels is regionally recognized for its well-planned, professional tours and outstanding, reliable service. 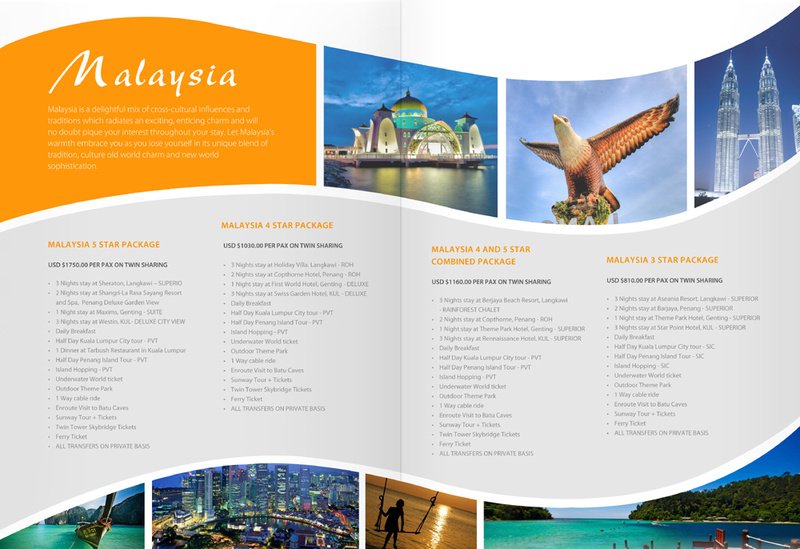 They cover a comprehensive range of travel services including World-Wide Group Tour Packages, Independent Tour Packages, Free and Easy Packages, Incentive Tours, Visa Arrangement, Travel Insurance and more. The team of dedicated and helpful staff assists its customers in choosing the perfect tour packages from the wide range of products available. When it comes to organizing tours for incentive and special interest groups for corporations, Shirazi Travels is a smart choice. Shirazi Travels has successfully arranged both short and long-haul trips for reputable schools, community centers, government agencies and major established multi-national companies. The aim is to provide the best service and exciting itineraries at affordable prices to our clients, and most importantly, to ensure that each and every trip is an enjoyable one. 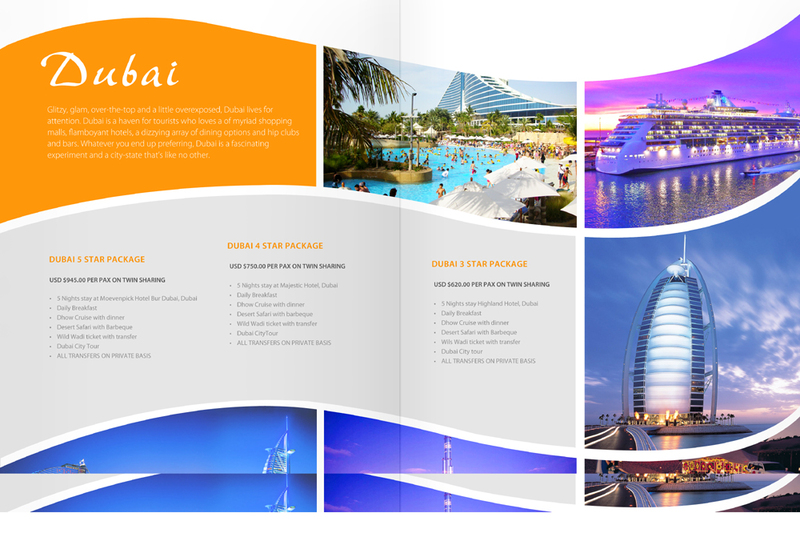 Shirazi Travels launched its Corporate Travel Department in 2000 on order to cater to a growing demand in the market. Within a year, it was admitted into the panel of prestigious multi-nationals. Today, the agency is not only service FIT travelers but also handles the corporate travel needs of various major corporations and more than 50 SMEs. Our team of experienced staff provides personalized service to all our corporate clients. Backed by computer data for accounting and sales, Shirazi is linked directly to the state-of-the-art GDS (Global Distribution System) including, Amadeus, Galileo, World Span and Abacus, which enables them to provide up-to-the-minute flight, destination and seat reservation Information instantly. Shirazi Travels is the first BSP (Bank Settlement Plan) and E-ticketing agents in Pakistan with auto-ticketing facilities. When you entrust your entire travel planning to Shirazi, you can be assured that you'll be well taken care of all the way to your destination. 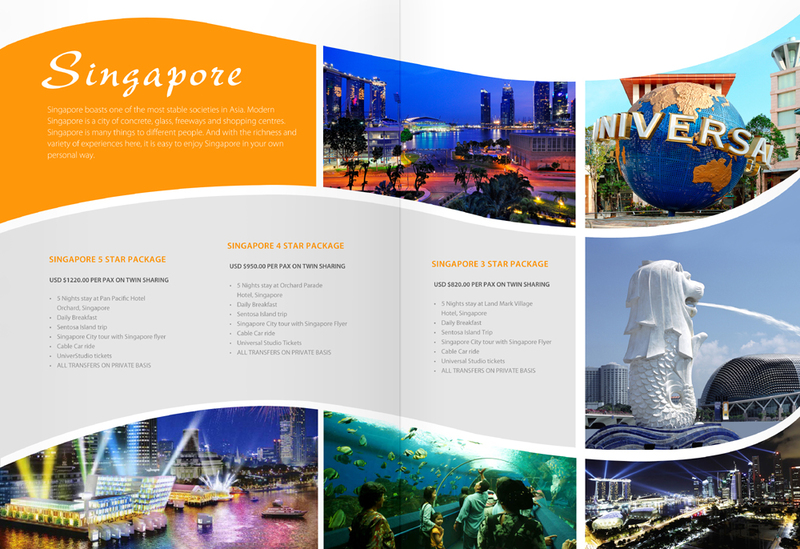 We look forward to assisting you in making your travel dreams a reality in the near future. Many packages and options are available. 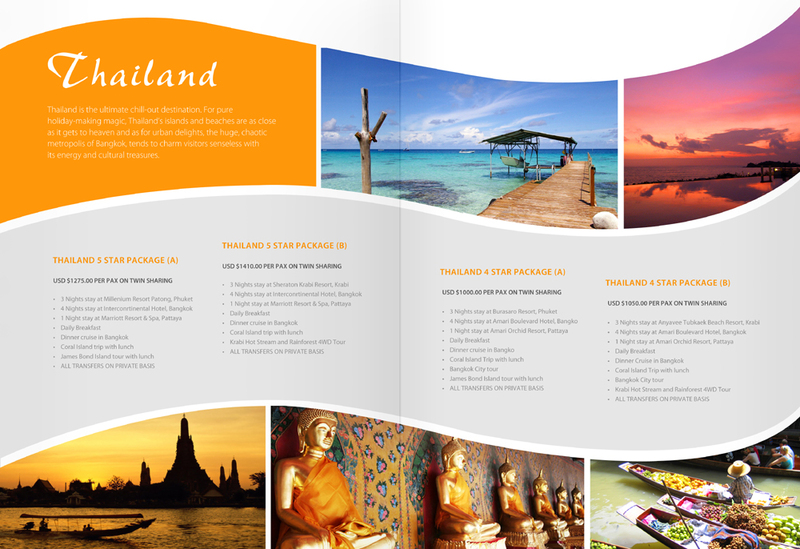 Visit one of our offices and let one of our experienced travel and tour consultants guide you to your next adventure. PATA: Pacific Asia Travel Association. 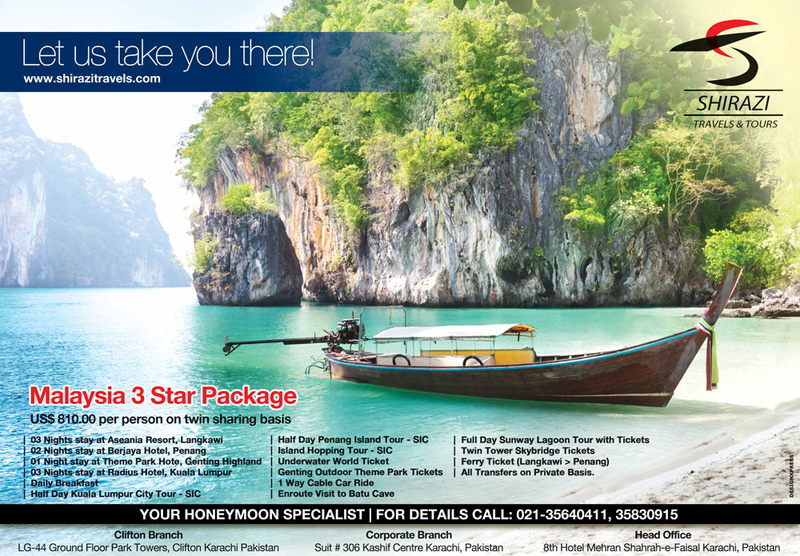 TAAP: Travel Agents Association of Pakistan. KCCI: Karachi Chamber of Commerce and Industry. 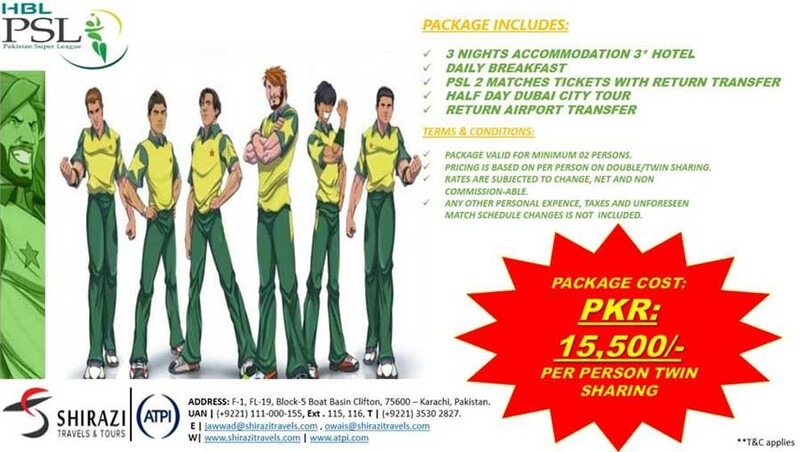 Services: All types of travel related services including International Air Tickets & Hotels, Exotic Tour Packages, Hajj & Umra, corporate travel and much more. 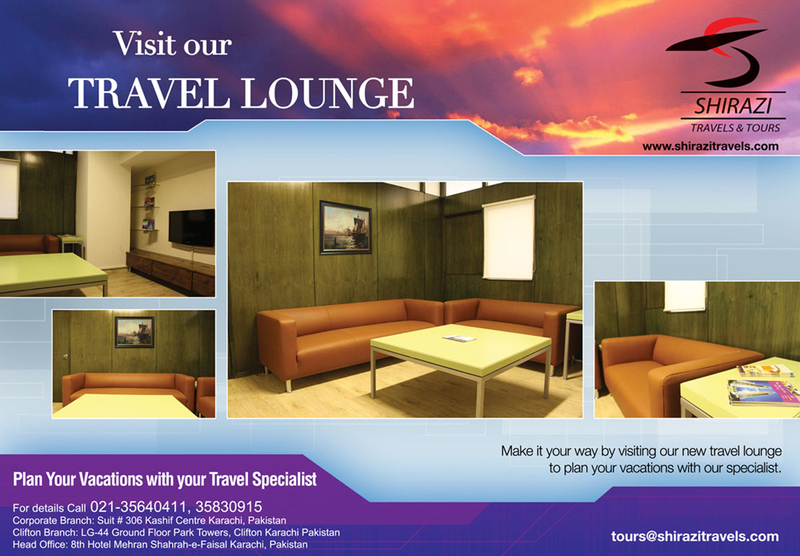 What to Expect: Friendly, efficient and professional travel services in a new comfortable office.